provides comprehensive coverage of research in agriculture, biology, veterinary medicine and related fields. As the premier index to the world's veterinary literature covering 2,380+ veterinary journals, it is an excellent resource for those working with animals [Coverage: 1910 to date]. developed by the National Library of Medicine (NLM), is the first database of choice for searching the human medical research literature. Covers 90+ veterinary journals. Using the Purdue Libraries link to PubMed provides direct links into the Libraries' online journals. [Coverage: 1946 to current]. -- also has a Single Citation Matcher to help figure out partial references. provides good cross coverage of the sciences, social sciences, and arts & humanities as well as the options of doing author and cited reference searching [Coverage: 1900 to date for Science Citation Index portion of database]. -- also have access to Journal Citation Reports which provides journal "impact factors." For resources that are not available at Purdue, you can fill out the Interlibrary Loan online request form. 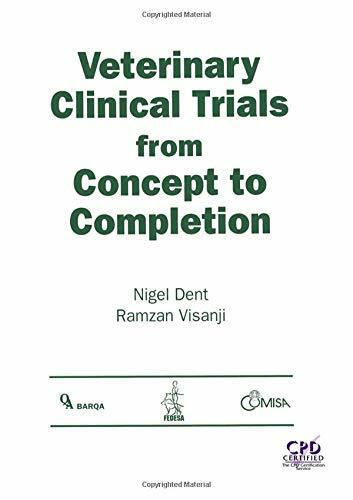 Veterinary clinical trials from concept to completion by Dent, N.
Selected resources on conducting research and communicating research results more clearly and effectively. Includes information on research ethics, speaking and presentations, writing and publishing and style manuals. A search of the Purdue Libraries catalog on "clinical research" yields both print and electronic titles. Theses and disserations done at Purdue can be seen electronically though the Dissertations and Theses (ProQuest) database. For current information, see the Purdue Graduate School Thesis/Dissertation Office web site. Handbook of Evidence-Based Veterinary Medicine by Cockcroft, P., Holmes, M.
(EBVMA) is professional organization with an international scope that was founded to better organize the emerging research, training and practice of evidence-based medicine. Evidence-based veterinary medicine is the formal strategy to integrate the best research evidence available combined with clinical expertise as well as the unique needs or wishes of each client in clinical practice. Much of this is based on results from research studies that have been critically-designed and statistically evaluated. See links to latest articles and books on EBVM. A search of the Purdue Libraries catalog on "evidence based veterinary medicine" yields both print and electronic titles. A search of the Purdue Libraries catalog on "evidence based medicine" yields both print and electronic titles.